1. Select the right social media outlets. With new social media sites popping up every day, it’s tempting to join them all. However, not every social media channel is the right fit for your company. For example, if you are targetting older professionals, you can pass on YouTube and Instagram and focus on LinkedIn and Facebook to receive better engagement. 2. Remain consistent across your social media accounts. According to a study conducted by SDL, “60% of millennials surveyed expect a consistent experience from brands whether online, in-store or via phone.” Consistency across media outlets can be a deciding factor for a customer choosing between you and a competitor. Start by using the same profile picture and username for each account, and then focus on image, voice, and colors. Not only does consistency reinforce your brand, but it keeps your audience focused on the material and message (plus it looks good). 3. Use colors that align with your brand’s goal. Colors not only give a brand meaning and personality, but certain colors appeal to different audiences. By sticking to a color scheme, your brand will appear professional and united. This doesn’t just stop at logos– for all posts on social media, you should incorporate the same colors to create visual consistency. This is extremely important for Instagram; whether you choose to filter photos or not, try to use one or two filters and stick with them. 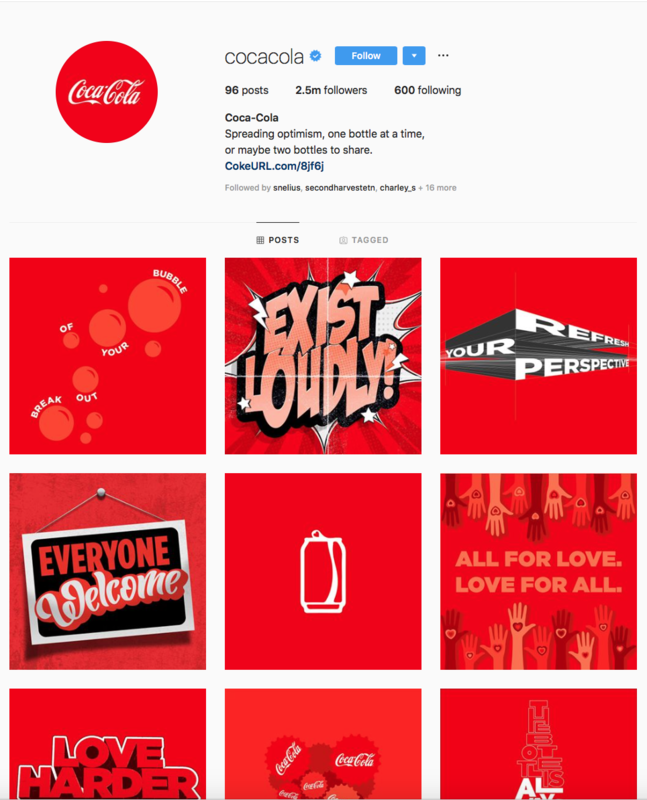 Check out Coca-Cola’s Instagram after their recent rebrand for an uplifting and aesthetically pleasing wall of inspiration. This is the most important part of building your brand. Imagine the brand as a person– take into consideration demographics such as age and gender of the brand, but also consider psychographics such as interests and personality. If your brand is more niche, use acronyms and industry-specific language. Young brands can get away with using slang and modern trends on social media. Don’t forget the company culture– is there a hashtag that would reflect the culture and be impactful to users? 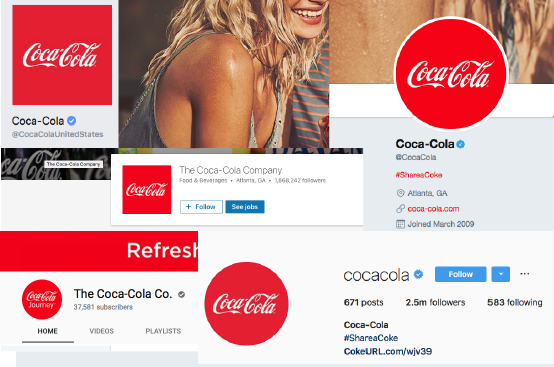 For example, check out Coca-Cola’s tweet announcing their social media revamp. #RefreshTheFeed was created to promote the brand’s deep roots in kindess, optimism, uplifting actions, and connection amongst its consumers. If your social media posts and comments are personable, consumers are more likely to respond and engage with the account. This is also an easy way to create awareness. Respond to user inquiries on a first name basis and establish a personality. Some of the best social media accounts are known for their witty, and well-thought responses. 6. Be consistent with content topics. Curating content is the perfect way to build a reputation in your industry while providing users with posts that aren’t self-promoting. Finding appropriate blog posts, videos, and images to share with your audience sounds simple, but requires regularity. Start by finding a few topics that are related closely to your industry and focus on these areas of expertise. Maybe even start a hashtag to use on your posts, like Coca-Cola did. 7. Use visuals to tell a story. People are more likely to engage in social media posts that include infographics, images, or videos. A recent study completed by HubSpot revealed that “photo posts attracted 104% more comments than the average post” and “84% more link clicks than text and link posts.” This means every post should be using some sort of visual component, so get creative! Being inactive on social media is an easy way to be forgotten. Depending on your audience, set a weekly number of posts to publish. Looking into your analytics tools will help you gauge the best days to post, as well as which posts perform the best. 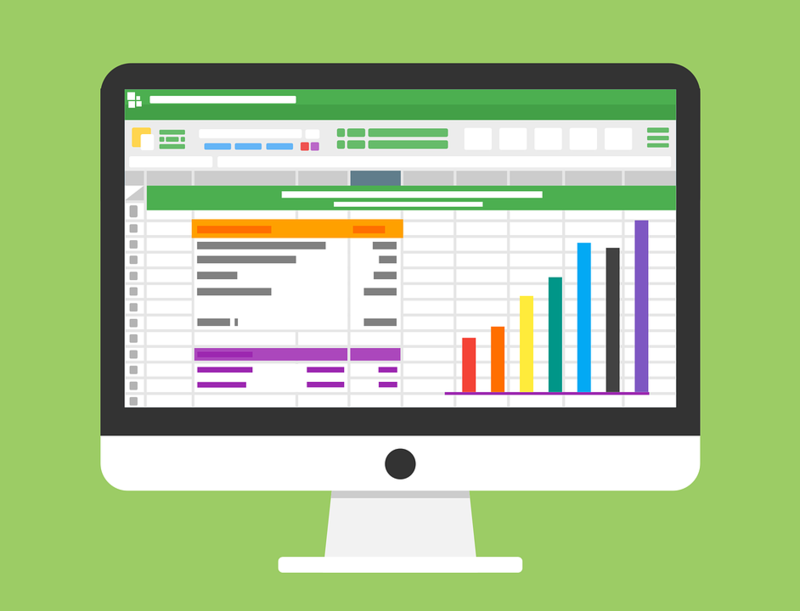 Always track and review your analytics to maximize your engagement. Social media publishing tools can be beneficial, as well as creating monthly content calendars with planned posts for each social media outlet. 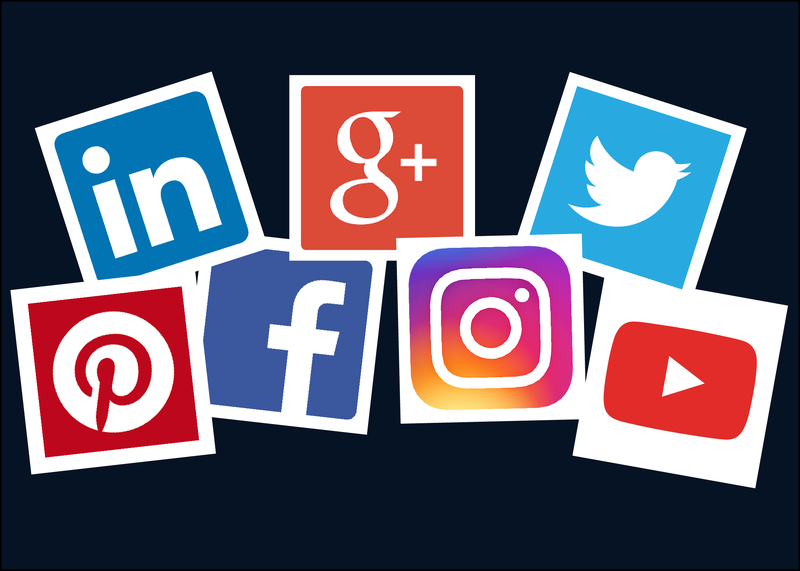 With all the different aspects of social media, it’s easy to focus on gaining followers and forget about your social media performance as a whole. However, when you prioritize consistency in branding and content, the results are incredible. Follow these tips and to stand out, keep customers engaged, and elevate your brand.